We’re at the farm. It’s winter, or at least what passes for winter in this part of the world, just down the road from the equator. The mercury nudged 26 degrees and I think I’m a bit pink after a morning in the paddock without a hat. We’ve come down for five nights, which is all the time The Husband can carve out of his work schedule. It’s not enough but it will have to do. Mum and Dad have joined us and today we took them to the Winter Harvest Festival, a highlight of the district’s social calendar. The festival is a celebration of the local food and producers, with stalls selling camel’s cheese, honey, macadamias, chutneys, jams, beef, coffee, beer, carrots, lavender, wine, beetroot, bread – and everything in between. There was a tractor pull and face painting and local bands playing. We took two cars, winding past stubbly, winter brown paddocks and a muddy Moogerah dam, joining hundreds of other cars and mini-buses at the Aratula Community Sports Centre. A 10-dollar admission bought us a shopping bag, a water bottle and access to a big shed and a bigger paddock lined with food stalls. The Ballerina and The Husband sampled wood-fired pizza and pulled-pork rolls. Mum and I bought veggies for dinner. We couldn’t find a plastic chair or spare hay bale to sit down, so juggled our coffee and tea and shared carrot cake standing beneath a shade tent. Dad ate a beef and cherry port pie. 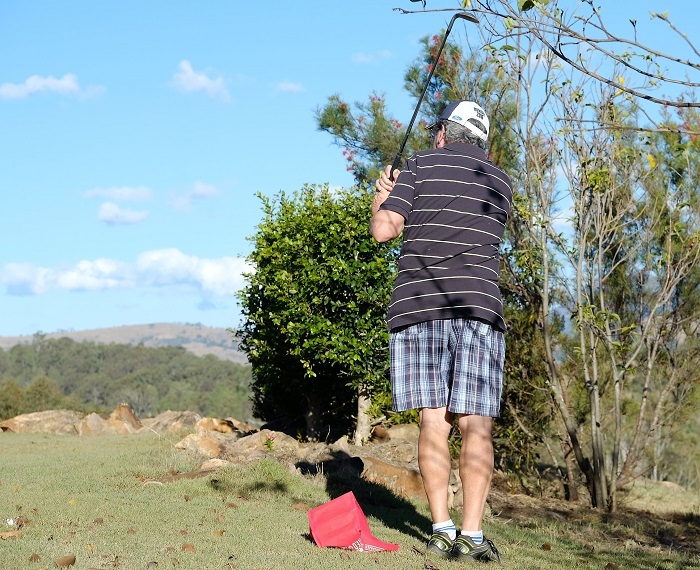 Later in the day, back at The Farm, dad practised his chipping game. The Husband did a crossword. Mum sliced up a left-over lump of beef into paper-thin slices for sandwiches. Eventually, everyone dozed; some on sofas and reclining chairs, others in bed with the blinds drawn and blankets pulled up to their knees. I took my novel to the swinging chair down by the fire pit to rock and read, warmed by the sinking sun and cooled by a soft breeze. But before the light disappeared completely I grabbed my camera for a walk, disturbing a mob grazing on our top paddock. At sundown the boys drank beer from a local brewery and Shiraz from somewhere colder. I drank Pinot Gris. Then we all ate curried chicken and rice with our local veggies for dinner. It’s much cooler now and it’s blowing a gale outside. We’re spread out in front of the open fire, fat and a bit befuddled, with books and cards and a movie on TV.